Circle the Wagen is a feature-length buddy/roadtrip/docu-dramedy by Ryan Steven Green about the vintage Volkswagen subculture in America. CIRCLE THE WAGEN is a feature-length buddy/roadtrip/docu-dramedy that follows Dave, an idealistic adventurer and automotive ne’er-do-well, and his convivial co-pilot Charlie—on their journey down Route 66 in a baby blue 1972 VW bus. Through mishaps and murals, gasoline baths and breakdowns, the two discover a teeming underground of vintage VW diehards willing to help save “The Croc” from the scrap heap and rally her beleaguered owner on to California. DAVE (the driver) is known for his adventuresome spirit and engaging personality. A native of rural Nevada, he graduated from the University of Southern California with a degree in Broadcast Journalism, then drove across the country to New York City where he lived out a life-long dream of playing in a rock band. His next adventure took him to Northern Iraq where he taught at an elementary school for the better part of 2006. Throughout both his collegiate and post-collegiate career, David has performed in numerous musical ensembles and appeared in several films. During his senior year at USC he was the host of the nationally acclaimed college talk show, CU@USC, and was awarded the prestigious title of "Mr. USC." CHARLIE (the buddy) is a producer, drummer, and working film, television, stage, internet and commercial actor residing in Los Angeles. He hosts musical colloquiums and M.oM. Day (Museum of the Month), a collective devoted to regularly exposing themselves(!) to exhibits, performances, tours, and all things cultural and culinary in the greater Los Angeles area. While attending the University of Southern California, Charlie majored in cinematic studies and minored in performance, writing, directing, producing and starring in award-winning and critically praised short films and plays. Charlie is represented by Origin Talent and is a proud member of the Screen Actors Guild. RYAN (the director) made his first documentary at the tender age of 19. Its subject was the “blue flame,” that is, lighting farts on fire. The topics of subsequent films are equally symptomatic of an unfashionably happy childhood: snails, moustaches, modern homesteaders, coffee, and now Volkswagens. A native of Los Angeles, Ryan received a BA in film with an emphasis on non-fiction filmmaking from the University of Southern California. He also minored in Neuroscience. His documentary work has sent him around the world for Emmy-winning PBS show Travelscope and can be seen in the films of Jay Duplass as well as the experimental feature documentary One Day on Earth. As a commercial director/editor his clients have included Nike, NASA, Torani, Plantronics, and PowerBar. He lives in Los Angeles with his wife of six years. 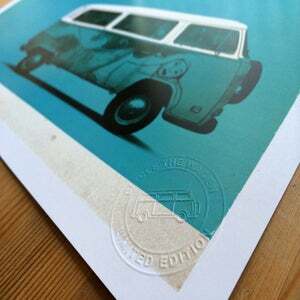 Crocodile Rockford Jobs — or “the Croc,” as it’s affectionately known — is a 1972 Volkswagen Transporter Deluxe. After spending its entire life suffering through one harsh midwest winter after another, resulting in significant rust damage around its bottom edges, the bus was put up for sale on eBay by its second owner in November 2006. This is where the Croc was discovered by Dave Torstenson. He found the listing for the bus, and—impressed with the owner’s thorough notes and 100% user rating—placed a bid for $787 in the closing seconds of the auction. As fate would have it, he won. He named his “dream car” Crocodile Rockford Jobs, after the song that was playing the moment he won the eBay auction (Elton John’s “Crocodile Rock”), and in honor of Steve Jobs, founder of Apple Computer, who purportedly sold his VW Bus in 1976 to finance the first Apple computer. Ironically Dave was working for Apple at the time, and sold Apple computers to buy his first VW Bus. NOW FOR SALE ON DVD! 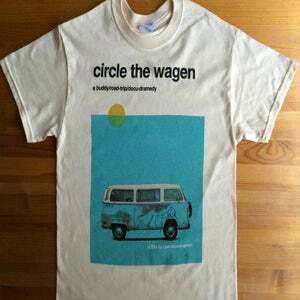 A limited edition DVD of CIRCLE THE WAGEN is now available for purchase from BrinkDVD! The DVD includes audio commentary from the film's creators (Ryan Green, Charlie Pecoraro, David Torstenson), as well as a couple special bonus features. Region free / 86 minutes. $19.95 + shipping and handling. Visit the Dubs at the Lake event page for more information. More information on Aircooled Drive-In #5 is available here. More information on this year's Buses Nowhere Near the Arch is available on the BNNTA website. More information on Field of Dreams VW Show is available on the website. Please visit the Arizona Bus Club's website for more information.